Is there ever a good reason to use Flash? Can it overcome the problems of accessibility, search engine optimization, easy updating, and interminable download times? I hope to make a good case for the (occasional) good decision to use Flash, while revealing how I constructed just such a site with maximum efficiency and user-friendliness as my goals. 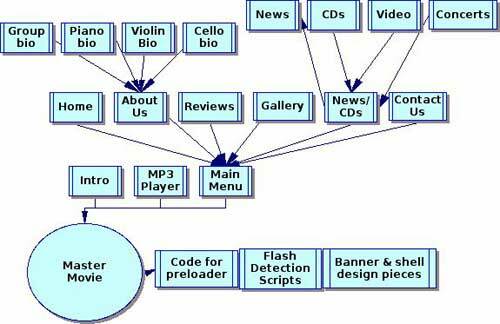 You’ll quickly see that the use of Flash in these sites is intended to engage the visitor in the immersive experience of music and movies. There are many side benefits to the use of Flash, such as pixel-perfect layouts and embedded fonts, but we’re going to focus on the multimedia aspect in this article. A page with an organized view of some of their concert and CD reviews. In addition, they wanted an elegant and clean look that nonetheless had visual interest by virtue of a few tasteful animations. And finally, I wanted a way to empower them to update the components of the site themselves without having to touch the raw Flash files (which have the extension FLA.) or email me too often. Let’s look at how we accomplished these goals. The trio wanted a design that matches the design of their latest CD of music by Ravel and Shostakovich. After planning the banner, color scheme, content, and layout, it was time to create the shell into which all pieces of the site load. The best approach for designing a Flash site is to keep it modular. It is not one Flash movie; it is many pieces (separate Flash movies) that load into or replace each other and form structural hierarchies. Take a look at the diagram of the various levels to the Gemini Trio site. As you can see, the master shell movie, at level 0, loads first. It then triggers the loading of its dependent movies, the main navigation bar for the site, the MP3 player, and the design elements (such as the banner) that are common to all pages. These are the components that will remain on the screen at all times. The last piece that downloads on the first screen is the (uh oh) introductory animation. By loading it into the main master movie, the visitor can immediately click a desired link without having to first click out of the intro. No “Skip Intro” button is needed here! Diagram of the Gemini Piano Trio Flash site. By creating multiple separate movies, the visitor has to sit through a download only for desired links. Let’s take a moment to look at what happens when we type in the address for the Gemini Piano Trio Web site: http://www.geminipianotrio.com/flash/. The first document that loads is a standard HTML index page. (Note: one of the benefits of loading Flash movies into standard HTML pages is that metatags can be added to aid in search engine optimization.) This index page has a Flash detection script that checks for the latest version of Flash Player, which is version 7. If the visitor has Flash Player 7, the master movie dynamically loads into the index page. After performing detection and determining that Flash Player 7 is installed, Master Movie begins directing a complex series of events. Before any visible content loads, Master Movie directs the loading of a hidden movie with a shared library that contains, among other common items, the outlines for embedded fonts that will be used throughout the site. After these common elements are in place, Master Movie directs the intro animation movie, the navigation buttons, and the MP3 player movie to load into its shell. These components are three separate movies that need to download before they can play. To give the visitor visual feedback that something is happening during the wait, a faded violin becomes progressively more saturated. The percentage and the number of kilobytes downloaded also appear on the screen in dynamic text boxes that get their information as a script from Master Movie runs. You can see, then, that by simply loading the MP3 player piece into something like level 21, it will always be visible and on top on the stage. The other thing to keep in mind is that movies are transparent except for the areas where there are actual objects such as an MP3 player. This allows the designer to layer components in Master Movie. If the pages for gallery, reviews, and videos keep their objects in the middle of the screen, even though their level may be higher, the banner at the top of Master Movie will still show through. The MP3 player movie only fills the bottom of the screen. 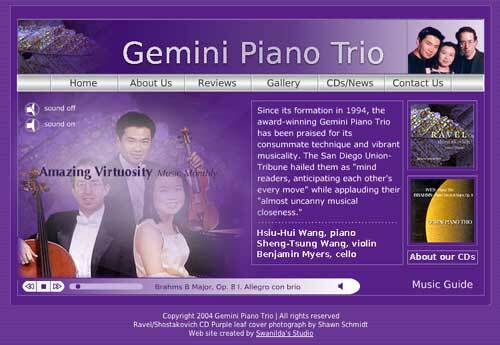 The violinist of the Gemini Piano Trio is very Web savvy, and, in fact, he created the standard HTML version of the group’s Web site. It became clear to me that he could easily handle updating the various components of the site himself if I gave him a little training. I typed out some basic directions, and spent a Sunday afternoon showing him the underpinnings of his Flash site. The important key I needed to convey to him was that he never has to touch an FLA file (these are the raw Flash files) in order to make his updates. The content, in the form of JPGs, MP3s, and TXT documents, is external to the Flash files, and loads at runtime. Note: Flash is also great at handling XML, databases, and scripting languages such as PHP. There are three areas in which I planned for client updating of the site: the MP3 files, the JPGs for the photo gallery, and the text for the various areas such as reviews, news, biographies, and concert schedule. By the time you read this article, the video pages should be complete, and I plan to make those easily updateable as well. Let’s take a look at the text updates first. This Flash site makes extensive use of dynamic text boxes. What that means is that the written content is not actually embedded in the Flash movies themselves. Rather, the content is “called” at runtime. I used ActionScript, which is the programming language of Flash, to code this ability into the “swf” (the extension used in Flash movies) files. The variable is “info” and the value is “Sheng-Tsung Wang, violinist” encased in HTML paragraph tags. Flash MX 2004 has some limited support for CSS, and an external style sheet sets the formatting for the paragraph tag. You can see that all the violinist has to do is modify the information in the plain text document. He was trained not to touch the variable or HTML code. • Open a text document called “slide_info.txt” that contains the following variable/value pair: totalFrames=8. At present, there are eight images in the slide show. If the group wanted to add two more, it would change the value to ten. Size the new images to the specification of 320 by 200 pixels, place them in the folder called “frames,” and name them according to our numerical conventions. Starting with image 0 (initialization commonly starts with zero), the images are named like this: frames0.jpg, frames1.jpg, etc. until we get to frames7.jpg for a total of 8 images. The numerical names serve an important purpose in that they provide the basis for a loop that cycles through the gallery. Here is where the process shifts a bit from the companion descriptive text document the gallery employs. Starting with Flash MX, some new functions were added to ActionScript. These functions allow for the manipulation of ID3 tags. ID3 tags add metadata to the MP3 file to give information such as title, artist, and composer. Now when the MP3 player loops through the sound samples, the title and composer are pulled from the MP3 file itself! This information is called into a dynamic text box on the MP3 player. The violinist (a PC user, ah well) can edit this ID3 information right in Windows Media Player. Let’s look at a picture of the MP3 player again, but this time with ID3 information displaying along its length. Embedded ID3 tags allow Flash to identify and caption the music as it plays. Note: Other “toys” in the MP3 player include a preloader that shows how much of the sound has downloaded. Because the sound is set to stream, the file begins playing before it finishes downloading. A related feature is the little ball that gives feedback for how much of the sound has played, and how much is still left. Finally, there is a volume control that allows the visitor to adjust the level by percentage. There is an alpha setting added to the ActionScript so that as the slider goes higher, the text becomes darker and more visible. As the slider goes closer to 0%, the text begins to fade. Flash MX 2004 Hands On Training by Rosanna Yeung—this book includes a CD with exercise files. I think it is the best book for beginners. The writer is an experienced educator, and goes through each step in great detail. Flash MX 2004 Beyond the Basics Hands on Training by Shane Rebenschied—this book also includes a CD with exercise files. This book is where I learned to program my MP3 player and create dynamic content that can be easily updated. Macromedia Flash MX 2004 Training from the Source by Jen deHaan. This book helps you explore features such as working with XML and using the new version of ActionScript. I used lessons in this book to create the reviews movie of the site. ActionScript Cookbook by Joey Lott. As you get more proficient in Flash, you’ll find yourself using ActionScript rather than timelines to create most of the functionality in your FLA files. Joey Lott is updating his book now, and the ActionScript2 Cookbook should be released soon. The Flash MX 2004 ActionScript Bible by Joey Lott and Robert Reinhardt. While you’re waiting for the cookbook with its recipes, you can delve into the intricacies of ActionScript 2, the latest version of the Flash programming language. This book has comprehensive information about all aspects, and it explains when it is best to use each function. where, once you become a member, you can get personalized help with your Flash projects from The Man himself. Joey helped me solve an ActionScript problem I was having with the sound in the intro animation. Community MX publishes two new articles, tutorials, or extensions each business day of the year. There are hundreds of Flash titles in the database, many of which provide unique content that can be found nowhere else. I hope you’ve enjoyed this intimate look into the construction of a Flash site, and have become convinced that there are times when Flash is the best choice. Now go visit the Gemini Piano Trio Web site. As you read all the latest news on upcoming concerts and CDs, you can smile smugly to yourself because you know exactly how that information got there.